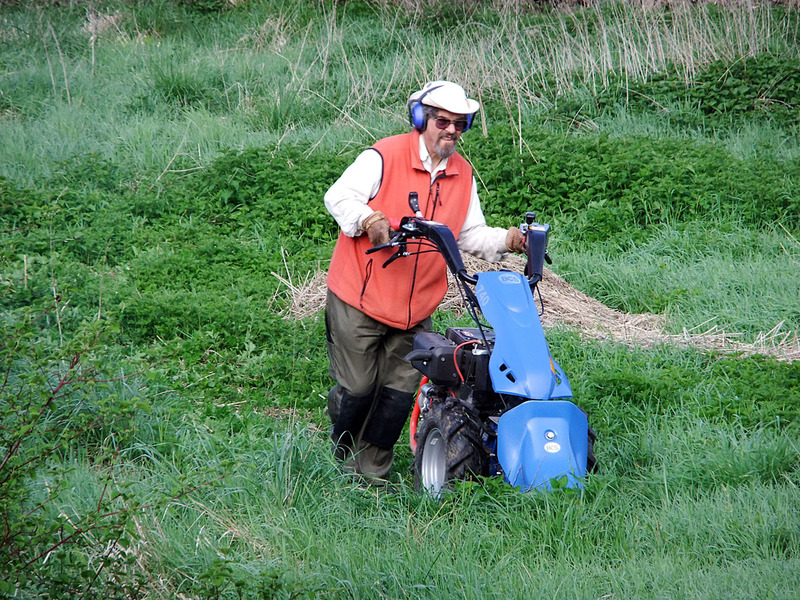 …went to mow a meadow! At the moment in my case, it is one man and his cat to follow on. 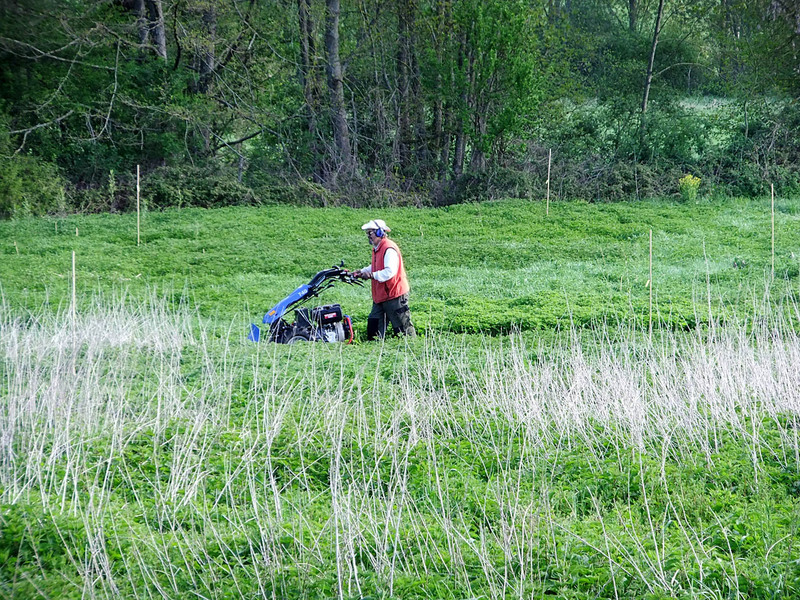 We have around two hectares to mow…. 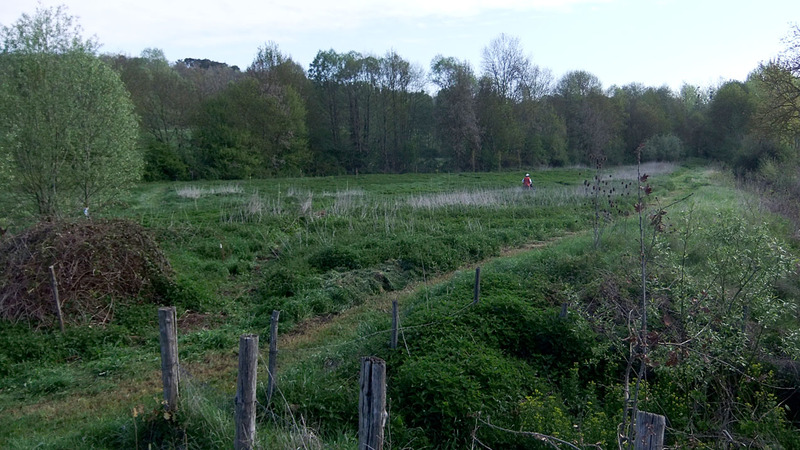 that’s around five acres in English money… and the grass needs to be removed to lower the fertility and allow the weaker species to grow more successfully and hamper the efforts of les orties* [nettles]. To mow we have “Betsy”… our big two-wheel tractor with its 53” cutter bar. To rake we have me and a Bulldog wooden rake… so at the moment we slowly get a field full of humps and rows that become humps…. and humps that become bigger humps…. and so on…. and on! When Betsy arrived she wasn’t heavy enough at the cutter bar, so a cut of around three inches [or fifteen centimetres… I am of old measure] became a one foot high trim whenever the wheel hit a molehill. It was very tiring to use and left me aching… then the suppliers Trackmaster sent me two weights to attach to the bar and all changed… she still bucks at humps but it is easier to get the front down again and she is, overall, more controllable… which is vital when working near the willows!! It is a big meadow…. this is the smaller bit…. The other reason for being able to mow large areas quickly and easily is that the meadow has Creeping Thistle [Cirsium arvense] Chardon des champs, which needs to be kept cut before it flowers and the wind dispersed seed blows everywhere. This is what the Wildlife Trusts have to say on the subject. So you can see that it would not be beneficial to the birds to erradicate it completely… not that I think I could!! we use the nettles as fertilizer and occasionally as food. Well, that’s my excuse, anyhows!! Still mowing…. here at least you can see one of the paths along the edge of the bief (millstream). Betsy is manufactured in Italy by part of the Ferrari works and moves at walking pace… so I’m driving one of the slowest Ferraris on the planet…. but there is a big advantage with that… we are working the land for the wildlife it contains and being able to stop instantly and walk forward to inspect for nests when birds fly up is a great help… also, by cutting the grass and not chopping it with a flail or a whirling blade, allows the grass to fall aside and allows small beasts to fly, walk, run away. Occasionally I get flying voles… these rocket out of the grass and run along on the top, before diving back into the sward… when they run ahead, this is usually repeated a few seconds later. 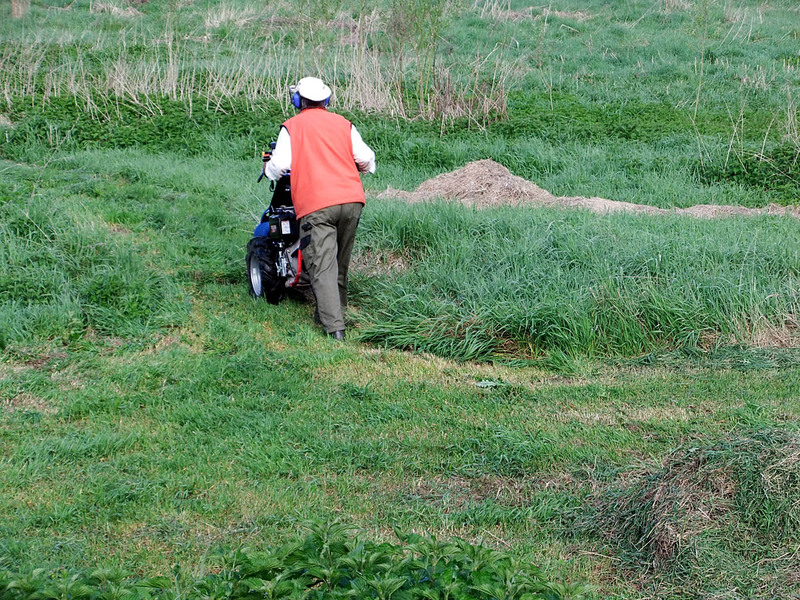 One of the first ‘humps’ is visble to my right in this picture…. it grew as the year wore on…. and had finished at around this height when I mowed through it last week. We will be able to harvest compost from the bigger of these piles. Betsy has another attachment… a big wood-chipper that can handle up to three inch trunks…. but that’s another posting. ← 2010 & 11… Almost caught up!